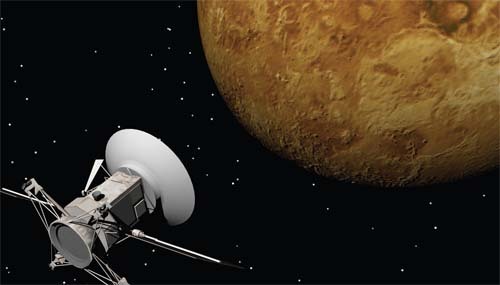 What is the purpose of sending spacecraft to distant objects? Although telescopes on Earth and in Earth’s orbit are wonderful instruments for scientific discovery, there is a huge amount of information that cannot be collected from Earth’s vicinity. We cannot, for example, use active methods (like hammering, drilling, or even just touching) to get detailed knowledge about a planet’s surface or a moon rock. Many surface or atmospheric details are too small for even the largest terrestrial or Earth-orbiting telescopes to resolve. Sometimes, too, the view to a distant object is obscured, so detailed observation is only possible close up. Spacecraft sent to distant objects also serve another vitally important role: They let humans test and develop advanced technologies that benefit all of humanity. In so doing, they further the human urge to learn, explore, and achieve new things.